Over these past several months, I’ve written a lot about beauty because I’ve experienced so much of it! However, I’ve also witnessed ugliness and felt it firsthand. 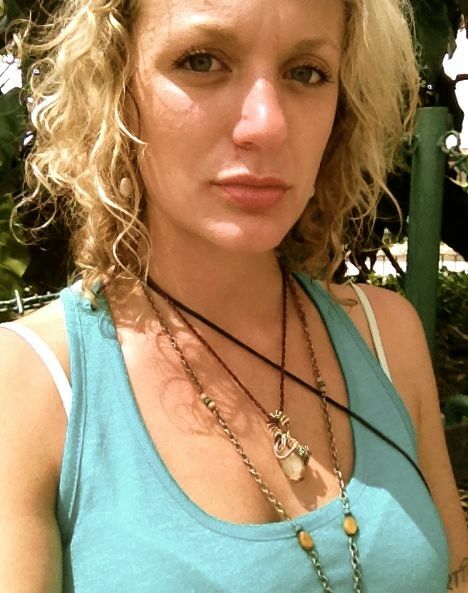 A sad-faced selfie, taken before entering the Guatemalan church where I refound my center, my peace. This world isn’t all glory-filled, sunshiney days. There is pain. There is sadness. There is despair and poverty and cruelty and evil. There are unwarranted, confusing disparities that just don’t make sense sometimes. There are people in this world who take for granted the lives they’re given, and there are those who violate others to fill voids inside themselves — the depths of which I’m grateful I don’t understand. Let me be frank — this world can seem pretty fucked up sometimes. The goodness can seem overtaken by gruesome, awful, anger-inducing evil which can rock us to our cores and really piss us off. I’m a pretty calm, accepting, go-with-the-flow kind of girl — for this I am grateful. But, right now, I’m feeling upset and hurt and just plain mad and it’s been hard for me to feel my spirit shine after being wronged. 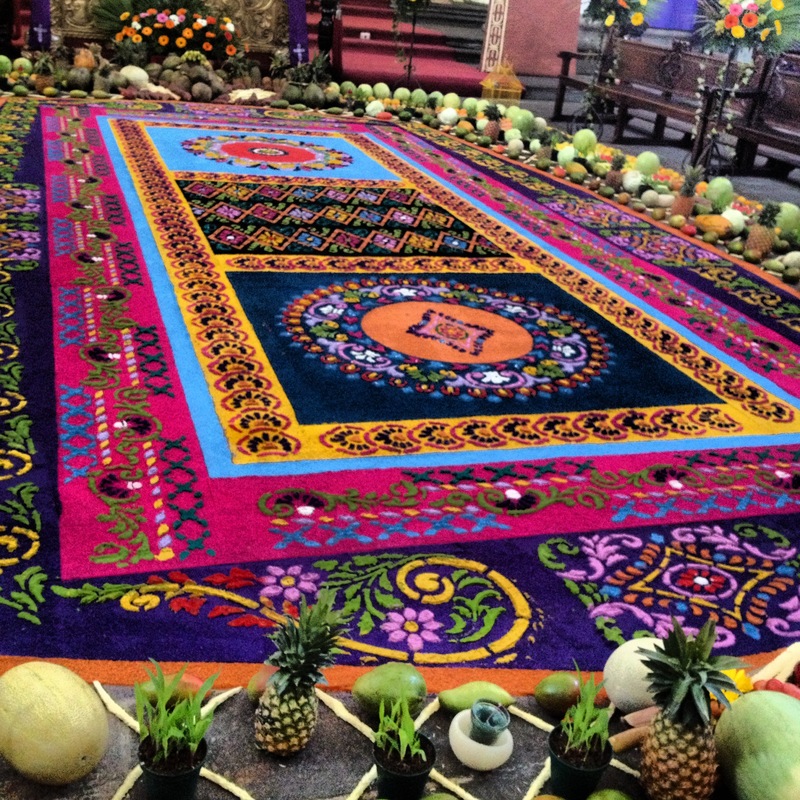 Sometimes beautiful things (like these sawdust carpets created for Latin American Easter celebrations) coexist with ugliness — and it’s just not fair. This morning, while trying to distract myself from my stress and anger, I stumbled into a church. It’s a couple weeks before Easter and the Latin American world is full of festivties. Antigua, the town I’m in now, is renowned for its celebrations and the town is packed — all hostels and hotels booked and the streets are full. So anyway, I’m in this church wearing flip flops and a leopard print tank, shoulders covered by a little beige scarf (an attempt at modesty), my blond curls looking like a floppy messy mop (which has become the norm for me these days), and I’m surrounded by a couple hundred black-haired, short, beautiful Guatemalans dressed in their finest traditional attire. I didn’t fit in, but I wanted to be there… I felt safe, protected, comfortable. I wandered around for a while, looked at the multi-colored, insanely ornate sawdust artworks covering the floors near the altars, gazed into a few pairs of oddly content Virgin Mary eyes… I was still pouting. I was still grumbling and confused… I was still trying hard to keep my small beige wrap pulled tight around me, hoping to go unnoticed as much as possible. And then… something happened. I felt beauty again! The world’s beauty started beaming right out of these people and the paintings and the statues and altars… I was brought to tears simply by feeling the grace of Spirit once again. Despite deciding I didn’t want to be in this country any longer, that I’d had it with Guatemala and Guatemalan people, I was once again brought back into the light. I was reminded that the vast majority of people in this world are good — we are loving, beautiful beings! Hearing the priest speak verses and prayers in Spanish, standing and kneeling alongside everyone else, I felt grace. Grace of god, grace of the universe, grace of life’s positive energy… whatever it is, I felt it. I started crying. I closed my eyes and clasped my hands, knelt, and prayed. I prayed for light and peace to come back into my heart. I prayed for forgiveness for this other person, and strength for me. Although I’ve been blessed to live a good, happy life, I’ve also experienced quite a bit of pain in the last five or so years. I’ve learned the grieving process quite well, and one thing I know for sure is that it requires strength to really let yourself go through the full process. So, for everyone living lives in physical or mental pain who have experienced trauma and are victims of violence, theft, abuse, etc., please know that you are loved and that you must keep going. That you must continue to let the light in despite feeling that darkness is all you see. We’re light beings, full of truth and genuinely positive energy, and we must do what we can to spread light, not darkness. Evil breeds evil, but goodness will always overcome if we make it our mission. So please, let love back in. When ugliness rears its head and tries to throw you off course, stand firm in the light and breathe. Let yourself grieve. And cry, scream, run, dance, go to church… Do whatever you must to expel the bad energy from your life, but whatever you do, don’t let ugliness break your spirit. You’re beautiful, and you deserve beauty. Always. I’ve arrived at an interesting space in my journey – I’ve made the decision to go back to the states and work. I’m going to work as much as I can and save as much as possible so that before too long, I’ll be able to set sail again. I’m excited about putting into action the lessons I’ve learned and the self-confidence and determination I’ve gained – which may be a challenge, but it’s one I’m pumped for. So, I’m off on a new adventure… Living cheaply while making and saving money. Stateside. But, it wasn’t always smiles. Let me be honest — when I decided to take this path, I wasn’t really happy about it. I spent a couple hours grumbling and pouting a bit, and then an evening or two (or a week, let’s be real) of slight anxiety accepting it, but now, I’ve made peace and I’m content and even a bit excited. At first though, I really had to remind myself on some of the truths I’ve received recently. Here are the things I used to make peace. First, we must listen to our hearts. We’re only guaranteed this moment, so let’s do what we can to make each moment be the best it possibly can be. Yes, that may mean doing some things that are less than perfect on occasion, as long as we know they’re helping us arrive where we want to be. Second, we have the power to make things happen. I believe that when we’re living authentically and from the heart, our soul really does shine through us. We become more attractive to the world — we’re brighter, sharper, more connected to the Earth and to our communities, and we’re able to love and be loved more! Therefore, when we’re living genuinely, we’re able to make things happen because we’re in tune with the internal forces that can make things happen (our self-power), and the external forces we use to help us along the way (the energies which control all things). For example, I know I’m going back to the states to make and save money to help fund something I feel called to do (return to the farm, travel more in Central and South America, travel to India… who knows in which order, and who knows if these things will always be what I’m called to do, and I’m sure other things will come up along the way, but for now this is what I feel). I know what’s guiding me and I’m confident I will find work I enjoy, that will help me save, and that will teach me lessons I’ll need in the future. What will I do exactly? No one knows just yet, except the Universe (but I’m thinking vineyard, wine tasting room, greenhouse, vegan restaurant… any ideas, shoot them my way!). As long as I live from the heart and let my spirit shine, good things will happen and the Universe will help me out. Third, we must accept and honor the cycle of all things. Everything that goes up must come down, but also everything that goes down must come back up. It’s ok that I’m going back home for a bit — it’s totally fine because I know when the time comes, I’ll be on my way again if that’s what’s in store for me. Everything is cyclical – there is no straight shot to anywhere. And finally, it’s all about acceptance and gratitude. Us humans have arrived at this point in evolution together, we’ve made all these tangible objects together, we’ve worked with the Earth together… everything is just as its meant to be. Which is beautiful. We must accept everything as it is and give thanks for it all. Being alive right now is exciting and wonderful, and we should have gratitude for our life and for the gifts we’re given from Mother Nature. With an attitude of acceptance and gratitude, we’ll be happy wherever we are. And that, my friends, is just what I hope to do. But going home isn’t a bad thing! Going home is beautiful! Once someone has spent some time away, home becomes so much more beautiful (to me at least, but I’ve heard this from many others as well). Although I didn’t “plan” on going to the states just now, it’s totally fine because there are awesome things happening everywhere on this planet. And, for some reason above my comprehension, I’m not meant to be back on the road just yet. Which, my friends, is absolutely fine. So, I’ve avoided saying exactly where I’m headed because I just don’t know… I’m trying to let myself stay open to all possibilities. But this is actually really freaking hard because the possibilities are ENDLESS! I’m becoming scattered and sometimes stressed when trying to nail down just where I want to be. I have great options in Texas and in Michigan, and I have a pull to wing it in say Nashville, or drive to Oregon as I’d planned before leaving, but now just on a lot less cash. So, who knows. But, one of the things I reminded myself of a few months ago was that when our hearts are conflicted, the wisest thing to do is nothing at all. So, when I know, I’ll know. When the point of decision has to be made, I’ll make one, and I’ll run with it. Then, if I decide I want something different, I’ll run with that! It’s all about accepting life as it comes and going with the flow, and living as happily and as genuinely as possible.